Compiled by two of the world's authorities on the subject and illustrated throughout in full color, this book is the most complete collection of photographs - 2347 strong - of conifers ever assembled. This new encyclopedia updates the authors' acclaimed earlier book, Conifers, originally published in 1986. That book forms the nucleus of Conifers: The Illustrated Encyclopedia, but the greatly expanded coverage of cultivars including many introduced in recent years, plus double the number of photographs, make the present work more than twice its size. The authors have added 10 genera bringing the total covered to 65. Included for each genus are notes on distribution, discussion of botanical characteristics and classification, and lists of species of particular merit. New in this twovolume set are a common name index, an index of synonyms, a suggested reading list, and a brief essay on photographing conifers. The photographs display fine details of bark, cones, and needles as well as general habit; many species were photographed during the authors' conifer forays to North America, Australia, New Zealand, Madagascar, Japan, and China. Like the earlier book, Conifers: The Illustrated Encyclopedia will be an invaluable identification tool for gardeners, landscape designers, nursery professionals, and plant lovers. It may also be used in conjunction with the detailed text descriptions in Gerd Krüssmann's Manual of Cultivated Conifers, available in an English-language translation from Timber Press. Everyone who has become intrigued with the amazing variety and versatility of conifers in the landscape will hail this book as a treasure. Front jacket photograph (both volumes): Garden at Sandringham House by J. R. P. van Hoey Smith. 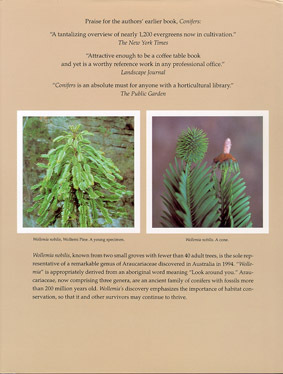 Back jacket photographs (both volumes): Wollemia nobilis, a species of conifer first discovered in 1994. Photos by M. Sherp and W Jones. D. M. VAN GELDEREN is an officer of the Royal Boskoop Horticultural Society and coproprietor of Firma C. Esveld in Boskoop, The Netherlands, one of the world's great specialist nurseries for conifers, maples, and rhododendrons. In 1994 he was awarded the Royal Horticultural Society's Gold Veitch Memorial Medal and in 1986 the Silver Doorenbos Medal by the Dutch Dendrology Society. J. R. P. VAN HOEY SMITH is director of the Trompenburg Arboretum in Rotterdam and president of the International Dendrology Society. An avid conifer collector, he travels extensively to photograph plants in their native habitats. He was awarded the Silver Doorenbos Medal in 1981 and the Gold Veitch Memorial Medal in 1984. In 1986 the Royal Boskoop Horticultural Society celebrated its 125th anniversary. The original edition of the book Conifers, the predecessor of the present volumes, was published to commemorate that centenary. The Society was founded in 1861 to bring order to the otherwise confused use of plants and plant names in the Dutch nursery trade. One of the aims of the Royal Boskoop Horticultural Society has always been the evaluation and judging of a wide range of plant species and cultivars for introduction into the nursery trade. As early as 1896 the Society founded a Judging Committee of seven persons, all very knowledgeable nurserymen, so there is a new centenary to celebrate--hence the publication of Conifers, The Illustrated Encyclopedia. The Judging Committee continues to play an important role in ensuring the quality and reputation of the Dutch nursery industry. The results of the trials are published yearly in Dendroflora, the yearbook of the Royal Boskoop Horticultural Society, published in cooperation with the Dutch Dendrology Society. Since Conifers was published, public interest in these plants has continued to grow, and the Royal Boskoop Horticultural Society is pleased to cooperate in the publication of this new, much more comprehensive work. An inventory was made to ensure inclusion of as many of the newer cultivars as possible, including many not published previously. Information and photographs for more than 1500 additional cultivars; were collected, many of the photographs taken in various parts of the world during the authors' conifer forays to North America, Australia, New Zealand, Madagascar, Japan, and China. Of course, many interesting new cultivars were found in Europe, too. After a careful study of all data and illustrations, a survey encompassing about 2300 different conifers is presented here. Results of additional taxonomic investigation and nomenclatural study of conifers have been incorporated. In the framework of this photobook, detailed descriptions of the plants are omitted because the pictures speak for themselves. Nomenclature is based on Gerd Krüssmann's Manual of CultivatedConifers with some exceptions, mainly changes of names and in classification made after 1984. We hope that Conifers, The Illustrated Encyclopedia, may be used and appreciated even more than the original book. By such use, we will be fully rewarded. 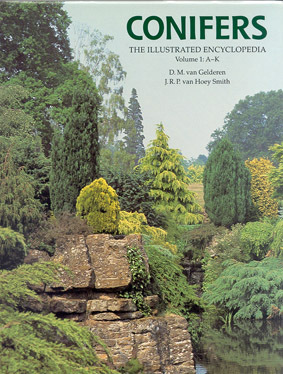 The authors wish to thank the Royal Boskoop Horticultural Society for its support, which has made possible this revised and enlarged work, Conifers, The Illustrated Encyclopedia.